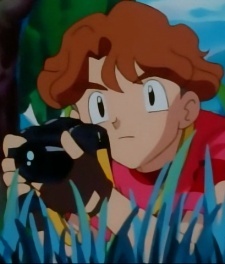 Anime: Todd first appeared in Pokémon Paparazzi. He had recently become famous after he took a picture of a supposedly extinct Aerodactyl (coincidentally the same one that tried to eat Ash, who was also on the photo, albeit blurred). He was hailed for being able to "capture any Pokémon on film". After seeing the article in a magazine, Meowth misunderstood the wording, not seeing the "on film" part. Team Rocket disguised themselves and hired Todd to capture Pikachu. Todd set out to capture the perfect picture of Pikachu, which irritated Ash - the two boys eventually settled their differences, however. Todd traveled with the group for a short time, but left at the end of The Breeding Center Secret before Ash, Misty, and Brock boarded the ship for Cinnabar Island. Later, Todd showed up again in Moving Pictures up in the mountains of Johto, trying to capture a picture of the legendary bird, Articuno. After successfully photographing the Legendary Pokémon in Freeze Frame, Todd went his own way once again. Manga: In Pokémon Adventures, Todd is a reporter and photographer on assignment at the Battle Frontier. There, he encountered the eccentric young Emerald - the strange young man ended up saving Todd from a wild Sudowoodo. He then followed the events in the Battle Frontier, aiding Emerald along with Latias and Latios during the crisis. At the end, Professor Oak asked him if he could work with him and if he could go to an island where there are lots of Pokémon, and take pictures of them. Pokemon, a simple video game that quickly became a global phenomenon that still touches the hearts of children around the world to this day. For longtime fans of the series, as well as new fans interested in the older games, this list will assist you in picking out which games are the best ones.